Are Christmas trees your favorite part of the holidays? 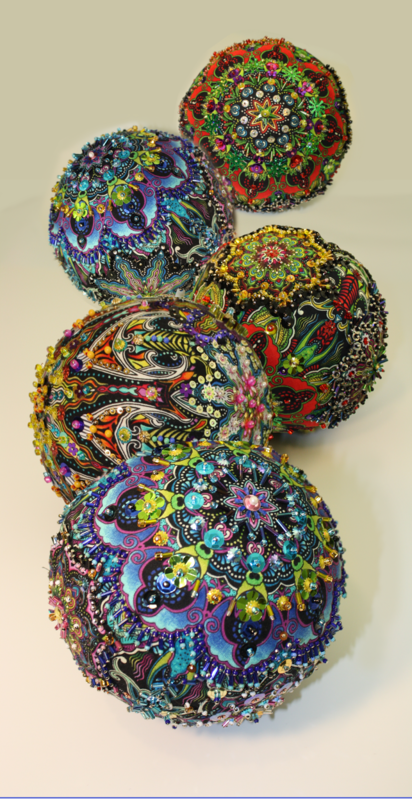 Wait until you add one of Paula Nadelstern's absolutely amazing Opulent Ornaments to your evergreen. 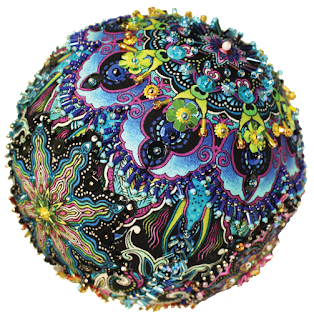 These no-sew ornaments start with a styrofoam ball and a fussy-cut kaleidoscope motif from one of Paula's fabric collections. Add beads and sequins to your heart's content, and you'll soon be adding one of these beauties to your holiday decor! Click here to download the pdf with Paula's detailed instructions for creating the Opulent Ornament. Her new collection, Kismet, available this winter, includes her signature kaleidoscope motifs that would work wonderfully for these ornaments; you can likely find her recent collection, Chromazone, in your local quilt shop as well. For a chance to win a bundle of one of our holiday collections, leave a comment below letting us know that you follow us on at least one of our social media platforms (either right here on the blog--options in the right hand sidebar, Facebook, Instagram, Pinterest), as well as telling us if you've ever added beads to a fabric project before. We'll randomly pick a winner and announce it next week! Giveaway is open through Sunday, December 11th at 11:59 pm EST. Wow! The ornaments are really pretty! Thanks for the giveaway. I follow on Bloglovin and I have used beads in my fabric projects. I love the ornament. Oh yes I like to add beads. I tend to get carried away so I have to stop myself. Those are gorgeous. I do enjoy adding embellishments to my quilting projects. I follow via blogger. I follow on this blog and facebook. I've seen her ornaments before and fell in love with them. They're just beautiful. Thank you so much for the instructions to attempt one of my own. I am a follower of the Benartex blog on Bloglovin' and via email notification, as well as on Facebook. Ooh, how beautiful! I follow the blog on Bloglovin'. Thanks for the giveaway opportunity! I've liked your FB page and read via email notifications. SUCH A NEAT ORNAMENT! THANKS FOR SHARING! 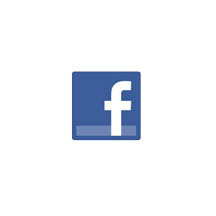 I follow by email and on facebook. I have not used beads in quilting, but have used buttons. I love your ornaments. I've made them before but never embellished them with beads. I love these ornaments! Thank you for the tutorial. I haven't put beads on any of my quilts, but I may have to make a couple of these. I follow Benartex on Facebook, in, and your blog via email. These are gorgeous! I follow via Facebook. That's gorgeous! I follow on facebook. Quite lovely ornaments! Can't imagine it otherwise with Paula's exquisite fabrics! I occasionally use beads, charms, and other stitch-ons with quilts and other fiber art. One of my current projects is a wall-quilt to honor my mother who is in memory care. I'm using some of her pins, pendants, and earrings to accent the design. I follow your blog via email. Thanks for the continued inspirations! janeherbst at roadrunner dot com. Breathtaking ornaments! I follow the blog. Wow the ornaments are gorgeous! I have added beads to wall hangings, and bags. I am a happy follower through e-mail, pinterest, and Facebook. Beautiful ornaments! I follow you with Bloglovin. I've never added beads to a fabric project before. Thanks for the free pattern and the giveaway! Those are lovely! I have never added beads to a quilt, but perhaps I should branch out! I follow by email! I have some Chromazone fabric and will be making some of these ornaments! The ornaments are lovely. I haven't used beads on any project. I follow the blog with email and GFC, also FB. I follow your blog via email notification. And yes, I have added beads to tiny quilts several times. Thanks for the opportunity to win. These ornaments are stunning. I follow on bloglovin and I have never used beads. I follow Sew In Love blog by email notification. I have added beads to quilted wall hangings. I follow via email. I have used pins & beads before but in crocheted ornaments. These are awesome. Yes, I get you here on the blog. I used to make wearable art vests and they had lots of beads and other embellishments. These ornaments bring back my childhood. These ornaments are beautiful. I follow via email. I follow on Facebook, Instagram, Pinterest & via e-mail. Years ago I made some Christmas ornaments that were balls, and I put beads on them. They were very pretty but not as beautiful as the balls here. Beautiful ornaments! I follow the blog and Instagram. I have used beads in my projects. I follow you via blog. Beading is something I've not yet attempted. Been gifted w/ornaments or clothing with beads and each is so beautiful. thank you. I follow your blog on my blogger dashboard/GFC. The ornaments are spectacular! I have added beads to projects a few times. I've also used hot fix crystals a few times. There are so many possibilities! I follow by email.Yes ,I have added beads to Christmas projects. I have used beads on projects before, and buttons too. I love the look they add. I follow via Bloglovin and Pinterest! Beautiful ornaments!! I've never made anything with beads. I follow on Facebook. I follow the Benartex blog via email and also follow on Facebook. Yes, I have added beads to some fabric projects. Amazing ornaments,wow! I follow on Feedly. Wow! I follow you by email. I have sewn beads on a couple of wall quilts - think it really adds pizzazz! I would love a chance to play with some of this fabric. Follow you on facebook: Nicole Sender & Instagram: minibea123. Yes, I've used beads in Christmas projects. My mom loved to make ornament with fabric and beads. I consider them my treasured keepsakes. I follow by E-mail and the blog--have never put beads on a project! I follow your blog via Bloglovin and I like you on Facebook. Thanks for the chance! 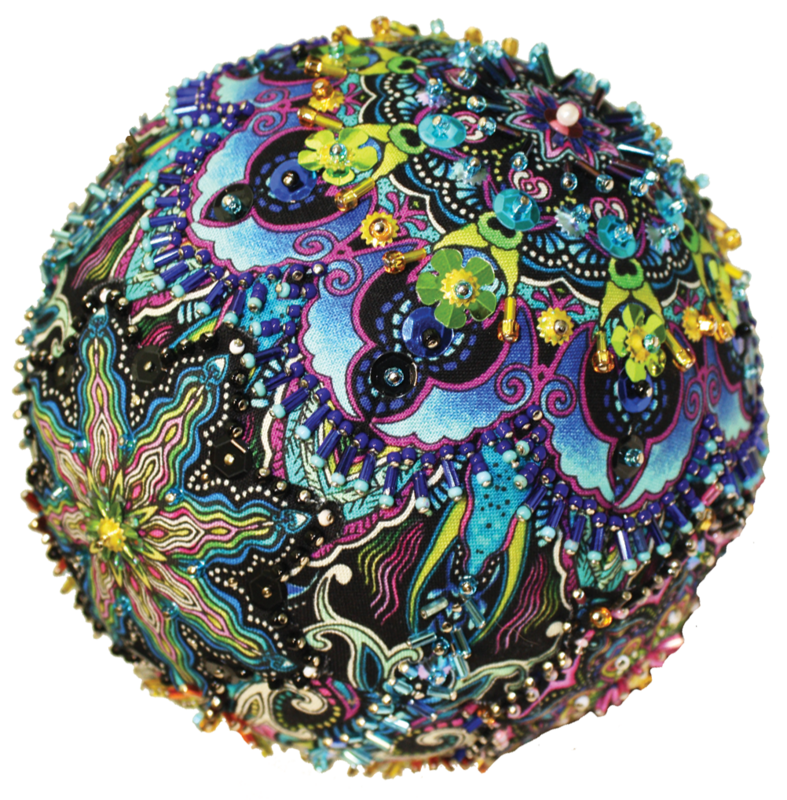 Yes, I have added beads to art quilts, but I've never made a beautiful ornament like this! I follow this blog w/ bloglovn. I have never done beads in a sewing project before. Gosh these are so pretty. I follow the blog and have not used beads with fabrics. Pretty. I follow through email. I follow you via email (wordygirl at earthlink dot net). I added beads to some Christmas stockings I made about twenty years ago (where does the time go?). Once I started adding beads, it was hard to stop! Wow what beautiful ornaments. Absolutely beautiful. I follow this blog via Bloglovin. Beautiful way of thinking. Isn't creative thinking the best place to be? I recently opened your fabric email and decided to explore your blog. Was I ever surprised. I will be returning again and again. I like to use pretty panels and finding patterns and ideas is not easy. Love the best idea also. Thanks for the website and blog. I follow on Bloglovin. I haven't added beads to a fabric project, but they certainly look beautiful on the Opulent Ornament! Thanks! I follow Sew in Love with Fabrics on Facebook. I follow your blog. I added tiny dark green beads to a Christmas tree mini quilt I made son after I started quilting. These ornaments are breath-taking! I can just imagine an entire tree filled with them. So intricate and detailed. I am a happy Bloglovin' and IG follower! Wow. Those look amazing! I have not added beads to any fabric projects. I like/follow on FB! Thanks for the chance to win! Very fun! I haven't used beads though I might start now! I follow on bloglovin and instagram. Thanks! Follow chrissie Debby, and Allison on the blogs!